Forget about David Bowie as a fashion muse. It&apos;s all about KISS. For V Magazine&apos;s music issue, models Pauline Van Der Cruysse, Cate Underwood, Nikole Luna and Amanda Ware got in touch with their rock & roll sides in full-on KISS regalia. 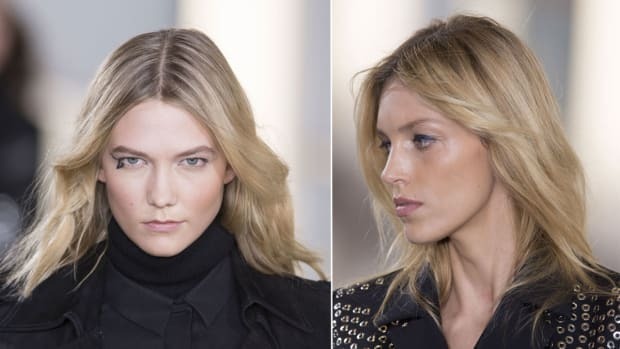 The models are dressed in head-to-toe Anthony Vaccarello and we must say, we&apos;ve never seen face paint look quite so chic. Don&apos;t you think they&apos;d make for an awesome KISS cover band? Let&apos;s try to make it happen. Photo: Via Fashion Gone Rogue. Dior Rumor Roundup: It's been a year since Galliano left Dior in disgrace, a move that created a rumor mill that puts Gossip Girl to shame. We take a look back at the many designers whose names have all been mentioned as possible successors over the past twelve months. Agyness Deyn Admits Her Real Age: The quirky Brit model finally confirmed what many fashion sleuths have been saying for years now: She's actually 29, not 23. Fake it till you make it and all that, right? The 2012 Academy Awards Happened! And we broke all the fashion down for you. Check out all the red carpet looks, our picks for the best dressed celebs (and who was tweeting about them), and the trends that even the fashion elite can't help but follow. Milan Fashion Week's Best-Reviewed Shows: Gucci, Pucci, Prada, oh my! If you couldn't make it to Milan Fashion Week, we've rounded up the seven most well-reviewed shows - according to the people who matter - for your viewing pleasure. Will body makeup be included?